On April 5, 2018, six activists– Nguyen Van Dai, Nguyen Trung Ton, Truong Minh Duc, Nguyen Bac Truyen, Le Thu Ha, and Pham Van Troi– walked into a Hanoi courtroom and were slammed with between seven and 15 years in prison on charges of “subversion.” All had slightly different focuses on their activism, but each one supported political prisoners and their families and advocated for human rights. Just five days later, another pro-democracy activist, Nguyen Van Tuc, was sentenced to 13 years. And on April 12, activists Vu Van Hung, Nguyen Viet Dung, and Tran Thi Xuan were sentenced to one, seven, and nine years, respectively, in three separate trials. Xuan’s trial was unannounced to the public beforehand– including her own family– and she had to face trial without her attorney. All in all, in April 2018, ten human rights and democracy activists were sentenced to a combined 96 years in prison over the course of just about one week. A year later, seven of these ten activists remain in prison. Six of them are members of the Brotherhood for Democracy. They are from all parts of Vietnam, of all ages, and of varied backgrounds. They have been transferred to remote prisons, suffered from health ailments, had appeals of their sentences denied, and one was even allegedly forced to give false testimony against another activist. Two of the original April 2018 Ten, Nguyen Van Dai and Le Thu Ha, were released early from prison but exiled from their country. Only one, Vu Van Hung, has completed his full sentence. Below, we update you on the some of the remaining prisoners’ current conditions. Increasingly, the Vietnamese authorities are targeting a wide range of activists: environmental protesters in big cities, religious practitioners in remote provinces, everyday Facebook users in the north and the south alike, and democracy and human rights activists affiliated with dozens of independent media and civil society organizations. In the year since the April 2018 trials, authorities have turned their attention from the Brotherhood for Democracy to the Hien Phap group, which aims to educate citizens about their constitutional rights. Authorities arrested nine of its members before planned protests in September. They’ve also targeted people known to call for or participate in national protests in June 2018 against two bills on cybersecurity and Special Economic Zones. And so far in 2019, authorities have already arrested nine people in the wake of a new Law on Cybersecurity. The majority of them were arrested for posting social and political commentary online. Vietnam has also extradited two former political prisoners, Truong Duy Nhat and Nguyen Quang Hong Nhan. And one female activist– Huynh Thi To Nga– who was abducted from her workplace in January, remains missing. The message from authorities is clear: No one is exempt from the crackdown on dissent. The international community must also be clear in its response. With the EU-Vietnam Free Trade Agreement’s final approval still pending, we call on European leaders to condemn the imprisonment of those who participate in peaceful activism and to call for the release of all Vietnamese political prisoners. The latest visit was on March 22, 2019. Two lawyers, Nguyen Kha Thanh and Ngo Anh Tuan, went to Detention Center of Nghe An Public Security to meet Dung. He was said to be in good health and spirits and worried about his family. On March 13, 2018, Nguyen Van Tuc’s wife, Bui Thi Re visited him and received a letter writing about his health situation. He has been suffering from many serious diseases, including hemorrhoids, a degenerative spine issue, chronic keratitis of the eye, and coronary artery disease. In addition, he also has lost weight because of his insomnia. He has been in a dangerous situation because of both health problems and inhumane treatment in prison. Tuc is enduring mistreatment at the notorious Prison No. 6 in Nghe An province. He has been placed in a cell with a cellmate who allegedly beats Tuc in exchange for leniency from authorities. Prison authorities are also allegedly withholding food sent by Tuc’s family. The latest report on him was about his cards for the occasion of Lunar New Year. He sent hand-written cards to his family and his friends, wishing them all the best in the new year and giving thanks for their support. But his wife, Bui Kim Phuong, was blocked from travelling to Germany at Tan Son Nhat International Airport on March 7, 2019 after campaigning for Truyen’s freedom. Security forces detained her because of “national security” issues. 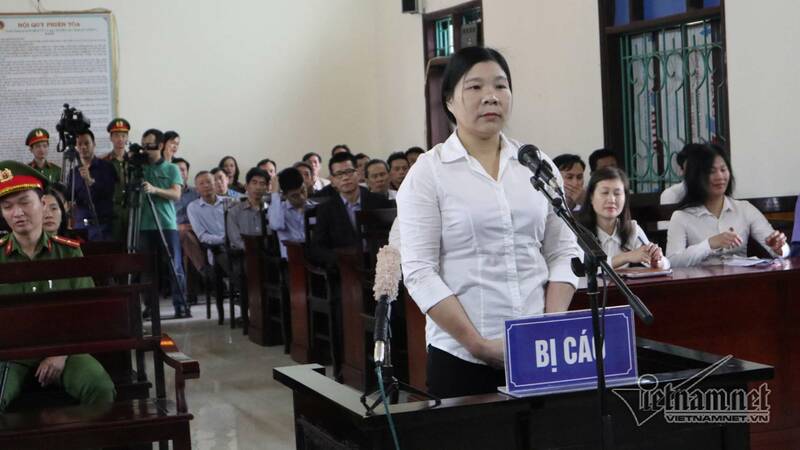 On February 26, 2019, Nguyen Thi Kim Thanh went to visit her husband Truong Minh Duc at Detention Center Number 6, Thanh Chuong District, Nghe An Province. Before their meeting in the afternoon, a detention officer watched Thanh closely. Duc was said to look unhealthy and thinner. His diseases, especially blood pressure and heart disease, have worsened because Duc was worried about his family after not hearing any news about them. He told his wife to bring him a glucometer to check for diabetes, which might be causing his tiredness and weight loss. Nguyen Thi Kim Thanh was temporarily detained while traveling in late February. She traveled to Germany to visit her relatives on January 6, 2019 and returned to Vietnam on February 21. At 7:55 am, Thanh made a phone call to her family and informed them that police “invited” her to work with them at the airport. Police finally released her at 1:00 pm after confiscating her passport. This detention might be because of her advocacy for her husband during her trip in Germany. Nguyen Trung Ton’s wife has reported that in spite of his serious health problems, for which he needs to have surgery, detention officers have not allowed Ton to do a check-up or have medical treatment. Because of the long distance to his detention center, visiting him has created challenges for his family, especially financial issues. His wife has to care for their elderly mother and a disabled daughter. On April 2, a security officer watched her carefully when she was selling at the market.